Dan’s been showering me with gifts lately. The baby snake a couple of days ago, and then yesterday he caught me a swallowtail butterfly. I had him hold it for a couple of photos and then asked him to put it on our hydrangeas on the off-chance it might not fly away right away. It didn’t, and I was able to get some nice shots of it. 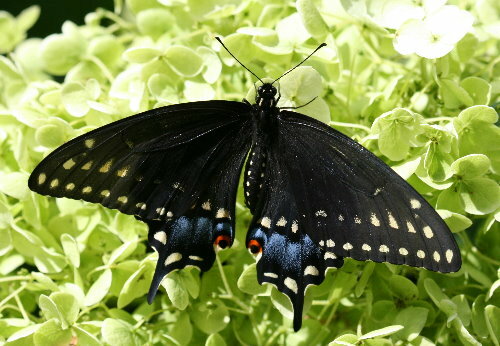 We have two black swallowtails that occur here: Black Swallowtails (Papilio polyxenes) and black-morph female Canadian Tiger Swallowtails (P. canadensis). From the top, the easiest way to tell the two apart is the orange spot at the corner of the hindwing – in Blacks it’s got a black dot in it, while in Tigers it’s just solid orange. Also, Blacks will show that faded yellow band partly up the wing, while Tigers don’t. 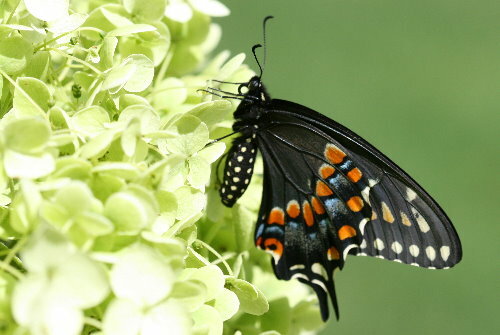 The extensive blue in the hindwing makes this a female Black Swallowtail – males will have a bolder mid-wing yellow stripe and much reduced blue. Black Canadian Tigers are apparently rare, but at least up here in eastern Ontario Black Swallowtails are near the edge of their range and so not a whole lot more common. I would see Black Swallowtails from time to time back in the Toronto area, but I’m not sure if I’ve seen one since moving east. My mom had one at their place farther east from us this summer, though. Black Swallowtail caterpillars feed on plants in the parsley family, Apiaceae. This includes, of course, parsley, but also a number of other cultivated and native species such as carrot, dill, fennel, parsnip, Queen Anne’s Lace and other plants that bear similar umbrella-shaped inflorescences. I haven’t seen caterpillars on any of my parsley plants, or on the wild parsnip or Queen Anne’s Lace in our area… but I haven’t looked too closely, either. The species overwinters in the pupa stage, which means they’ll be caterpillars through the fall, so I should keep an eye on our plants and see if anything turns up. Great shot and good, crisp, informative writing. Just had a black laying eggs on the Cilantro yesterday.